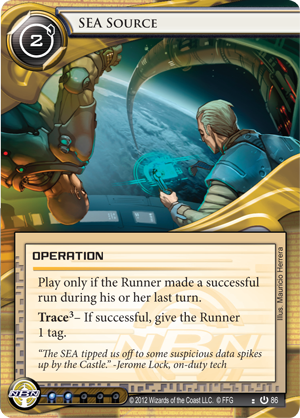 Since the recent release of Kala Ghoda, fans of Android: Netrunner have begun to explore the political and criminal intrigues of Mumbad and the Indian Union. Still, there's much of the cycle yet to be released, and both Corps and Runners can look forward to discovering and experimenting with a wide range of new tricks and tools. The next of these are soon to be released in the second Data Pack from the Mumbad Cycle, Business First. While, in the pack's announcement, we've already explored how Jinteki hopes to promote its Palana Foods (Business First, 30) division in order to deflect attention away from its more questionable clone policies, 2013 World Champion Jens Erickson draws our attention today to another of the Data Pack's cards, one with a far more clearly Criminal nature and intent. Even before winning Worlds back in 2013, it was well-known among the Winona Squad that if I ever had the chance to make a card, it’d absolutely be Criminal. I’m a fraudster through and through—Criminal my faction and crimes my stock and trade. 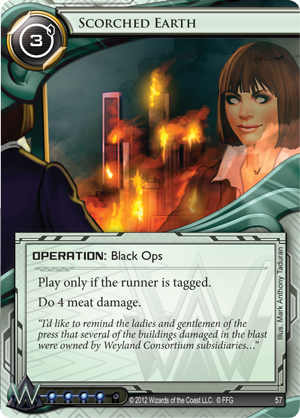 I knew the faction, but the question that arose after Worlds was what would the card be? 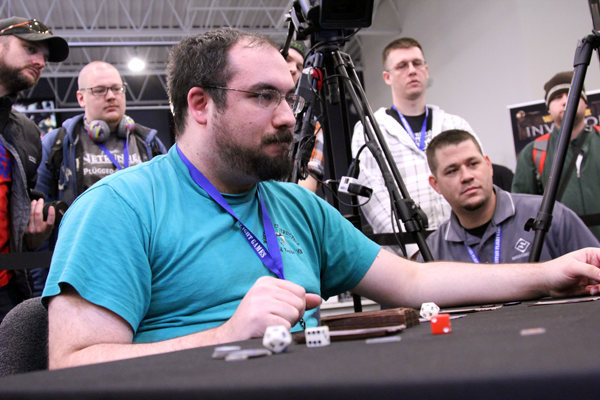 Android: Netrunner is a game with infinite possibilities for card ideas and areas to explore, and picking just one idea and only one card to print, was an extremely large question to which I didn’t have an immediate answer. 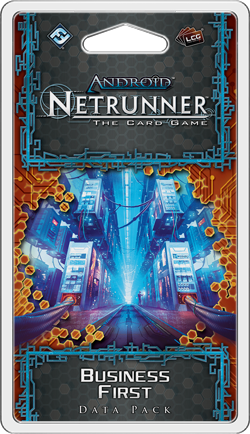 Do something that’s never been done before in Android: Netrunner. Attack the Corporation rather than assist the Runner. Make a card that I’d recognize immediately as my style. Even with this set of criteria, I still struggled to find exactly the effect I wanted. The breakthrough came when I was speaking with two of my best friends, Kaz and Chris. I asked them what card they thought fit me best. Both of them named a card from a different game, and it was the perfect suggestion. Translating its effect would offer Android: Netrunner something the game had never seen, it would absolutely stunt the growth of the corporation, and it would certainly fit my unique play style. I passed my idea to the developers, and after some playtesting and some alterations to Influence and Cost, CBI Raid (Business First, 22) was born. CBI Raid is a multi-purpose HQ threat that is designed to provide a huge tempo swing for the Runner, both by disrupting the Corporation's plans and by giving the Runner a window to build resources or attack other servers. Interestingly enough, my favorite moment with this card was the first time I had CBI Raid played against me. It was a huge blow, knocking me back a full grip, and I couldn’t have been happier. Neutral Usage. These are the times where CBI Raid is played while there’s no huge activity on either side. 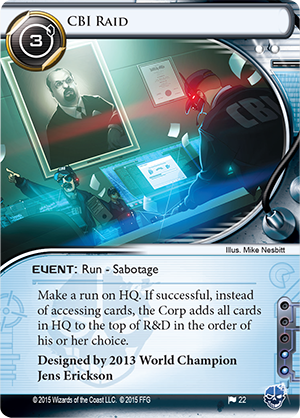 In these instances, CBI Raid acts as a pause button on the Corporation's plans, giving your Runner a substantial advantage as the Corp is forced to spend upwards of three clicks and two mandatory draws just to return to the full five cards that you can hit out of hand. If the game is in a situation that favors you, this usage of CBI Raid allows you to stretch the amount of time the game stays in that favorable balance. Disruptive Usage. There are instances when placing the Corporation's HQ back into R&D allows you to completely disrupt the active plan of the Corporation. 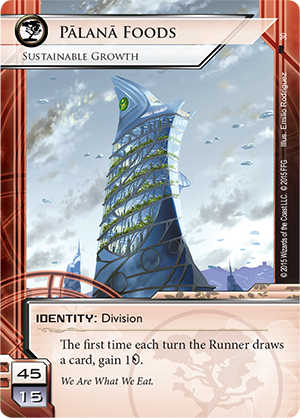 In playtesting, these instances would come up most commonly against "fast advance" decks playing with Biotic Labor (Core Set, 59) or SEA Source (Core Set, 86) and Scorched Earth (Core Set, 99), as the Corporation would not have the clicks to redraw these cards and play them within the same turn, giving you more time to properly deal with these threats or neutralize them completely. Offensive Usage. My favorite use of CBI Raid is to play it offensively. This involves attacking R&D in some manner after landing the raid. 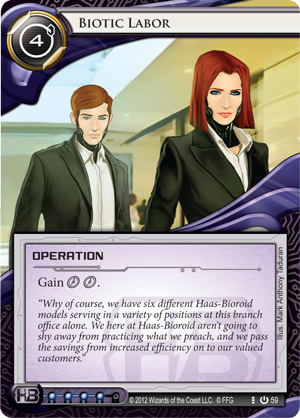 While it's often expensive to make multiple central runs, the added threat of an immediate run against R&D drastically changes the order in which the Corporation returns the cards to the top of R&D. The Holy Grail of this strategy, then, is Keyhole (True Colors, 61), which means that your CBI Raid threatens not only to return the Corp’s HQ to R&D, but shuffle it away, completely demolishing the Corp's best laid plans. What other scenarios will you find for CBI Raid? My hope is that you get just as much enjoyment out of this card as I’ve gotten from developing and creating it. I can’t wait to hear about the stories that follow when the CBI comes knocking! Are You Ready for the Raid? How will you use CBI Raid? How will you defend against it? 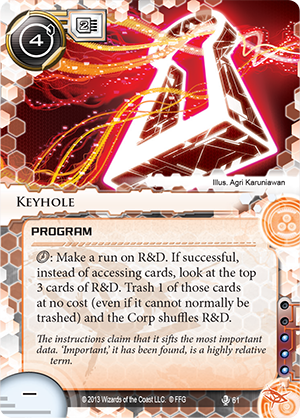 In the ever-evolving cyberstruggles of Android: Netrunner, it pays to keep one step ahead of the game's bleeding-edge tech, so start working now on your CBI Raid designs. The card and the rest of the Business First Data pack are due to arrive at retailers Thursday, March 10th!